The Lab of Ornithology at Cornell University has many trails that are in wetlands where it's very easy to walk around and observe the birds. Many people have donated money to the Lab, and there are benches everywhere. This particular bench overlooks the lake where it's very easy to see a Blue Heron Nest. It is covered with an arbor and trumpet vines. It's a great place to sit and observe the birds. Photo details: Exposure time 1/60, Aperture f/2.8, ISO 100, Focal Length 70 mm, 35 mm equivalent focal length 113mm, Lens Canon 70-200mm f2.8L USM, hand held. It sounds wonderful and the peek at the side of the bench int he arbor is tempting to want to go there for the view alone! 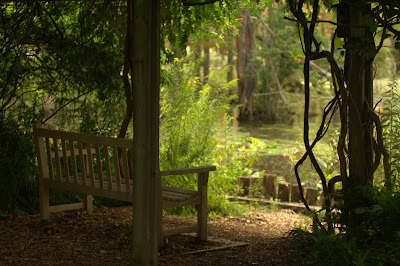 I enlarged it but still wish I could have seen more of the bench. How did I miss this blog! I love this picture, it just seems so serene. Nice colors, composition, the works. Bench of the Week #7, Ithaca Commons, Ithaca NY.